If very young may be used whole. If cooking is desired, boil for 10-15 minutes and serve as for swede above. Raw – may be served grated, as for coleslaw. 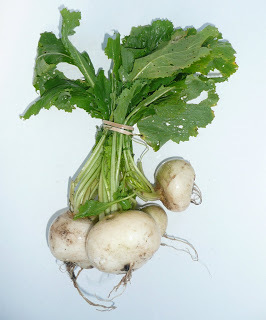 Trim turnips, peeling and cutting only if necessary. Place in roasting pan and dot with butter. Sprinkle rosemary, black pepper and salt as required. Roast at 200C for 20 minutes, then add peaches, sprinkling with sugar. Roast for further 20 mins and then serve with pan juices.